Milwaukee Brewers’ Brandon Woodruff (53) celebrates after hitting a home run during the third inning of Game 1 of the National League Championship Series against the Los Angeles Dodgers Friday in Milwaukee. MILWAUKEE – So they can hit, too. 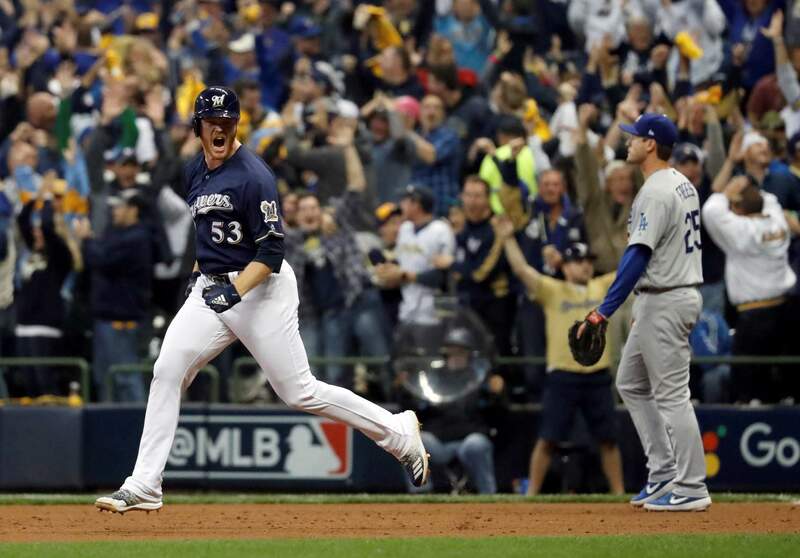 Reliever Brandon Woodruff stunned ace Clayton Kershaw with an early home run and Milwaukee’s normally shutdown bullpen held on – barely – as the Brewers beat the sloppy Los Angeles Dodgers 6-5 Friday night in Game 1 of the NL Championship Series. After starter Gio Gonzalez went two innings, nicked by Machado’s home run, Woodruff entered in the top of the third. In the bottom half, Woodruff made a sudden impact – with his bat. That ERA went up after allowing six hits and five runs – four earned – in three-plus innings. UP NEXTIt’s another all left-handed pitching matchup in Game 2. Ryu pitched seven shutout innings, striking out seven and allowing for hits, in the Dodgers’ Game 1 victory over the Braves in the Division Series. Ryu is 2-0 with a 1.96 ERA in four career postseason starts. Miley is making his second start of the postseason, going 4 2/3 innings in the Brewers’ Division Series-clinching victory over Colorado on Sunday. He is 4-5 with a 3.55 ERA in 15 career games against the Dodgers.